Britain's Alistair Brownlee said he has been given a taste of what to expect at the 2012 Olympics in winning Sunday's Hyde Park triathlon. The 23-year-old was cheered on by a bumper crowd as he met the criteria for 2012 selection with victory in London. "It was one of the best receptions I've ever had and the whole event was a great experience," said Brownlee. "The run down the last stretch was incredible. I'm sure there'll be 10 times as many people in 2012." Sunday's race, in wet conditions, also gave the field their only opportunity of racing on the likely course for the triathlon in London next year. Pre-race favourite Brownlee tackled it with aplomb, leaving the Serpentine after the swim in the top 10 and then pulling ahead as part of a four-strong group in the cycle before powering to victory by 25 seconds in the run. It was also a good race for Brownlee's younger brother Jonathan, who attained the 2012 Games selection criteria by finishing third. "It couldn't have gone much better today, with Jonny finishing third as well," said the elder Brownlee. "We only get one chance to ride round the course and it showed people hadn't ridden it, some of the corners were a bit dodgy, especially when it got wet." Afterwards, both Brownlees questioned how motivated some of their rivals had been, in particular Spain's Javier Gomez. The world champion is all but certain to be in the field at the 2012 Games, but was beaten to the bronze medal by Jonathan in Hyde Park. "Gomez is number one in the world, the world champion, and I didn't see him on the front so what was he doing? Olympic selection isn't an issue for him," said Alistair. Brownlee's victory caps a superb weekend for Britain, after 27-year-old Helen Jenkins from Wales won the women's race on Saturday. 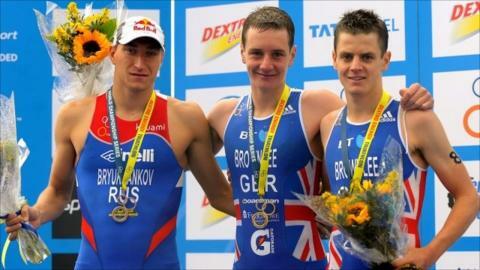 "It's been fantastic for Britain with two wins," said Brownlee. "I can't remember the last time that happened. And it's great for so many people to make the selection criteria." The World Championship Series next moves to Lausanne, Switzerland, on 20-21 August before the grand final in Beijing on 10-11 September. London 2012 organisers said they were pleased with the event, which was used as a test event for next year's Games. Debbie Jevans, director of sport for the 2012 Olympics, said: "We have been able to carry out a number of critical testing objectives. "The event has also given us the opportunity to do some rigorous technology tests and to deploy over 600 volunteers, who have been marshalling the course."